Even though this recipe for sauerkraut balls is Americanized, it combines ingredients Eastern Europeans love—sauerkraut, ham, onion, and garlic. When rolled, dipped in fine cracker crumbs and fried, they make a tasty appetizer, especially if served with honey mustard, and would be ideal for tailgating, potlucks, and other entertaining. For a lower-fat version, they can be baked in the oven. This recipe is adapted from one by The Fremont Company, makers of SnowFloss and Frank's Sauerkraut. Note: while there are multiple steps to this recipe, this appetizer is broken down into workable categories to help you better plan for preparation and baking. In a large skillet, sauté onion and garlic in butter over low heat for 5 minutes. Stir in ham and 6 tablespoons flour and cook until brown. In a large bowl, combine sauerkraut, 1 egg, Worcestershire sauce, parsley, and stock. Add to contents of skillet and cook on low until mixture forms a thick paste. Remove from heat, cool and chill 3 hours or overnight. In a deep saucepan, heat oil to 375 F.
Using a cookie scoop, form 1-inch balls. Then dip ​in 2 eggs mixed with 2 tablespoons water. Lastly, roll the balls in cracker crumbs. Let sauerkraut balls dry for 10 minutes, then deep fry until brown on all sides. Watch carefully, because this will only take a few minutes. Serve warm or at room temperature with frilled toothpicks and honey mustard, if desired. 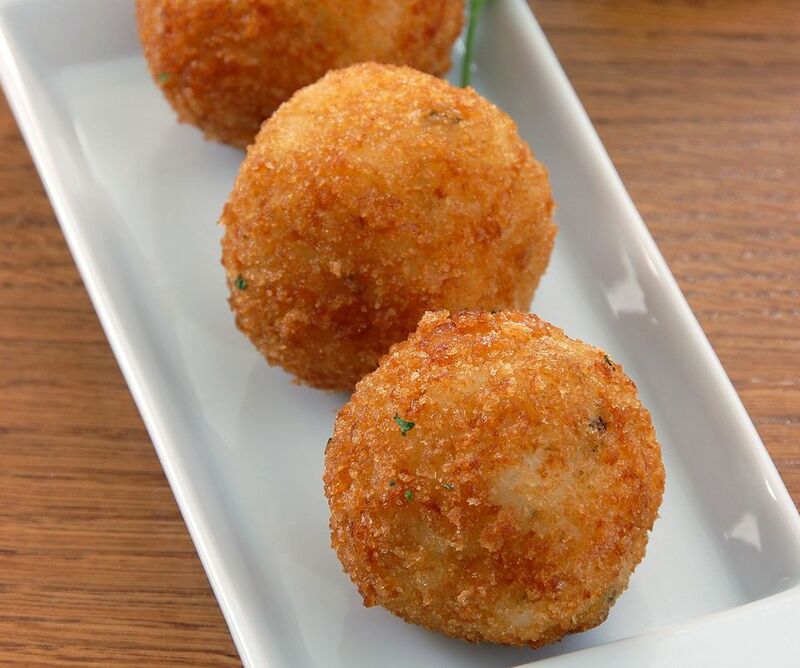 Sauerkraut balls can be frozen after breading and fried from the frozen state (watch out for hot oil splattering). For a lower-fat version, bake sauerkraut balls on a parchment-lined sheet in a 350 F oven for 20 minutes or until browned.